A microtiter plate was coated overnight with various antigens at a concentration of 5 μg/ml. 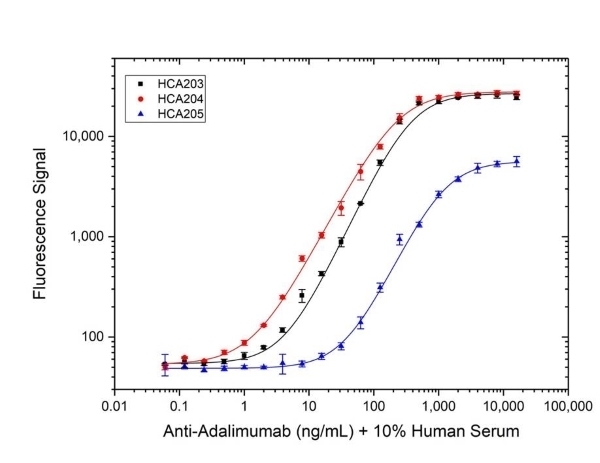 After washing and blocking with PBST+5% BSA, HRP conjugated Human Anti-Adalimumab Antibody, clone AbD18654_hIgG1 (HCA203) was added at a concentration of 2 μg/ml. Detection was performed using QuantaBlu Fluorogenic Peroxidase Substrate. A microtiter plate was coated overnight with adalimumab at a concentration of 1 µg/ml. After washing and blocking with PBST+5% BSA, Human Anti-Adalimumab Antibodies, clone AbD18654_hIgG1 (HCA203) (black), clone AbD18655_hIgG1 (HCA204) (red) and clone AbD18664_hIgG1 (HCA205) (green) in PBST + 10% Human Serum were added. Detection was performed using HRP conjugated adalimumab at a concentration of 2 µg/ml in HISPEC Assay Diluent (BUF049A) and QuantaBlu Fluorogenic Peroxidase Substrate. Data are shown as the mean of three measurements. Anti-adalimumab antibody is a recombinant, neutralizing anti-idiotypic antibody in fully human IgG1 format, suitable for bioanalytical method development for adalimumab and biosimilars. It can be used as the detection antibody in ELISA and as a reference standard in an ADA bridging ELISA. Human Anti-Adalimumab Antibody, clone AbD18654_hIgG1, is a high affinity anti-idiotypic antibody that specifically recognizes the adalimumab monoclonal antibody and inhibits the binding of adalimumab to its target, TNFα. The antibody can be used to measure the levels of adalimumab and biosimilar products in bioanalytical assays. Clone AbD18654_hIgG1 can be used to develop and calibrate immune response assays to measure the anti-drug antibody (ADA) response in patient serum. Adalimumab (branded as Humira) is a fully human monoclonal antibody (IgG1/kappa) approved for the treatment of ankylosing spondylitis, Crohn’s disease, psoriasis and several forms of arthritis. The antibody is specific for TNFα, and acts by blocking the activation of TNF receptors by TNFα. This inactivation down-regulates the inflammatory reactions associated with autoimmune diseases. 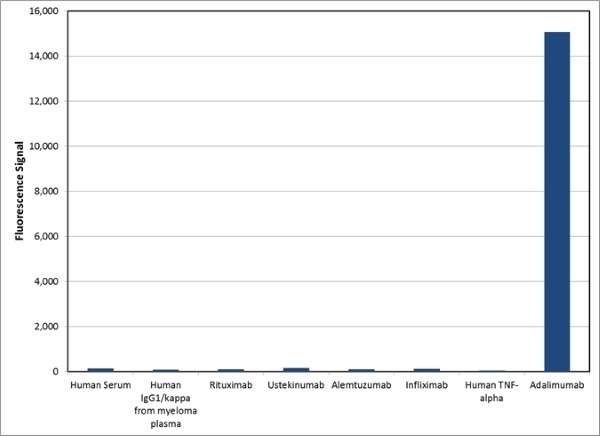 View a summary of all Anti-Adalimumab Antibodies. Human IgG1 antibody selected from the HuCAL® phage display library and expressed in a human cell line. This antibody is supplied as a liquid. 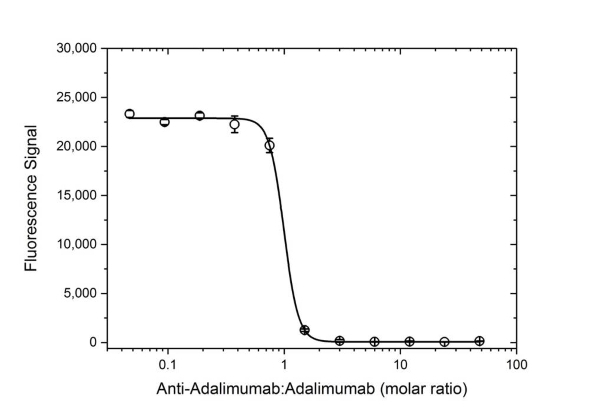 The monovalent intrinsic affinity of this antibody was measured as KD=0.15 nM by real time, label-free molecular interaction analysis on immobilized Adalimumab. This product may be used in an indirect ELISA or, when conjugated to HRP, as a detection reagent in a bridging ELISA together with HCA202 as the capture reagent.